The Sewing Lawyer is glad that a couple of readers noticed the little teaser at the very end of her last post. So here are a few more tidbits. In stash is this luscious pure wool fabric, purchased for me in Italy by a good friend a few years ago. She claims to have forgotten giving it to The Sewing Lawyer. But she did. Anyway, here is an extreme close up view of said fabric (there are about 5 little bumps to the inch so you're looking at about 2.25" worth of fabric). Black, textured, with tiny sprinkles of red, white and green. It's a little more vibrant in real life. 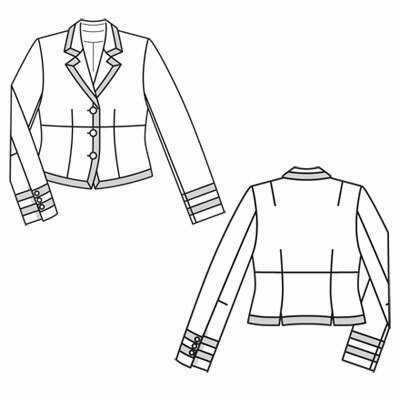 There are only 2 metres but I can get a suit (jacket and skirt) out of it if I use the pattern for this jacket again. Pros: It's a real fabric miser; I've got it fitted perfectly, and it's a cute and wearable shape. So my question. Given that I have dozens of patterns for jackets I have never made, is it wrong to make the same one again? Soooo, what else can I say about it? It does fit, as you can see. The shoulders are dropped but not excessively so. I made something between the smallest and second-smallest size and it seems about right. The fabric is stretchy and could be pinned together at CF, if I was so inclined. I like the simple zig-zag lace - it was very easy to memorize the pattern. To the right you can see how the sweater is constructed, from the inside. 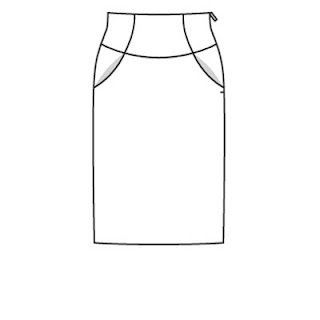 The horizontal line is where the back joins the front and lower edge of the collar. I've reinforced this line with a row of single crochet chain, to stabilize the shoulder line. The edges of the cardigan lie nice and flat - it's a simple edge - K3, P1, K1, P1 (on wrong side, K1, P1, K1, P3) and then on with whatever the body is. The 3 stockinette stitches at the edge curl to the wrong side and the 3 stitches of ribbing contain the amount of curl very effectively. You can see the wrong side of this edge on the collar. I'm contemplating my next project. I have a muslin cut out for this skirt. The problem is, as designed it's pretty skin tight. I've added 2 cm at CF and another 2 at CB, because I'm contemplating it in a woven suiting instead of a cotton-lycra sateen as Burda intended. Knitting. Sometimes you start slow and simple (bottom rib band of a sweater or the top rib band of a sock) and sometimes you have to plunge right into some sort of complicated manipulation or technique. Inevitably there will be chunks of relatively mindless knitting (back and forth, around and around) on an established number of stitches, and transition points where you have to engage your brain. However, overall knitting gives you lots of time to think. If you are making anything to fit the human body, the characteristics of knitting are truly wonderful. Its geometry and the fluidity of knitting combine to allow you to make the stitches flow and grow or decrease as the case may be, turn corners, attach new garment segments sideways, make holes and close them up again as needed, and do virtually anything to make the needed shape. Knitting designers love all this stuff. But do they care about fit? Right now, I'm working on a cardigan. 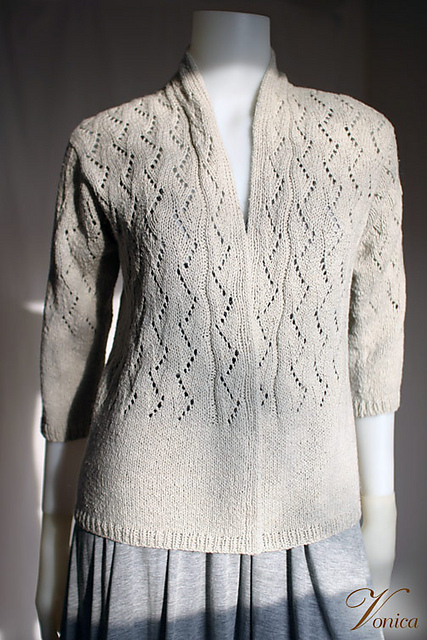 It combines a relatively simple lace pattern (7 stitch repeat over 16 rows) with some mindless stockinette sections. The pattern is by an accomplished designer, Bonnie Marie Burns (Chic Knits). It's called Vonica. It was first published on Ravelry in April, 2011. As of today, it has been favorited by 2,727 people, making it one of her most popular patterns, although there are "only" 184 projects posted on the site as of today. People really like this sweater. As does The Sewing Lawyer, I hasten to add. (I actually can't wait to finish this - I SO need a black cardigan...) It's just that, from a fit perspective, it's kind of strange. More on that below, but first read about how this sweater is built. Construction-wise, the pattern grows out of the centre back collar. You do a provisional cast on, knit a narrow strap to form the back collar, cast on to make the piece a lot wider for the shoulder on one side, and work the front down to the bottom of the armscye. 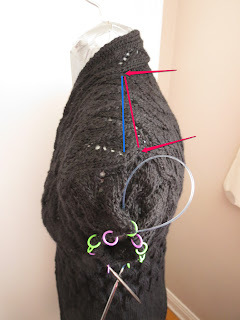 (This seems to flummox lots of knitters, judging from comments I've seen on Ravelry, but produces a shape that is completely logical to anyone who has ever sewn a garment with a shawl collar.) Next, it's back to the CB collar where you work in the opposite direction from your provisional cast on to make a mirror-image piece for the other front. Then you pick up stitches along the cast on front shoulder edges and the lower edge of the collar, and work the back down to the bottom of the armscye before casting on additional stitches at the armscye (for under the arm), joining front to back, and knitting seamlessly down to the ribbed hem. Then you pick up stitches all around the armscye and knit the sleeves, in the round, down to their ribbed hems. It's truly ingenious, as per comments above about knitting's fluidity and ability to change direction. I've just finished the body, and have started on the left sleeve. To the right, you can see what it looks like so far. Once it's blocked, the fabric should actually cover me ... although this cardigan is designed to be unfastened and looks pretty good even if the front edges don't touch or overlap. Here's the weirdness, at least to this sewing person. Everybody knows (don't they?) that the back, above the armscye, needs to be wider and longer than the front to fit the body. If it isn't, the garment shoulders will slip to the back, as the relatively-too-short back borrows fabric from the relatively-too-long front. 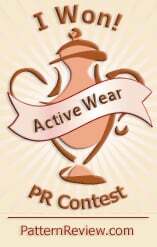 Moreover, the wider front shoulders will facilitate the garment's tendency to slip to the back. Bonnie Marie Burns did not follow these "rules". This pattern has many fewer stitches at the shoulder line in the back (22 in my size) than the front (29). In the intended gauge of 20 stitches to 4" (10cm) that's a dimensional difference of about 1.4" (3.5cm) Personally, I think the back fits my relatively narrow shoulders correctly. At left, you can see that the edge of the back armscye lies pretty much straight down from the shoulder point. At right, a view from above showing that, as I would have expected, the actual shoulder line (red) is slipping to the back. The blue line is the actual top of the shoulder. Believe me, the edge of the sleeve at front is falling off the shoulder. The fit of this cardigan is going to be quite different in the front than it is in the back. Neither is, in the abstract, wrong or bad, but shouldn't they match? I get that knitting is different from sewing, and its qualities allow different fitting norms to apply. But do they have to be so different? Is there something technical that requires this garment to be constructed this way?Or should The Sewing Lawyer stop fussing and enjoy the process? I mentioned in a recent post that the floaty wrap blouse from Burda Magazine (February, 2009) would soon make another appearance, in a form closer to what Burda intended. I'm sort of unconvinced. This is a printed wool blend sweater knit, which loses its sweateriness if you look at it from more than a foot away, at which point it looks ... kind of faded and tired, if I'm honest. Up close it is pretty interesting. But I don't want you to be THAT close! I tested this pattern (designed for a single layer construction of very light woven fabric) with a single layer of a hideous acrylic jersey from stash and kind of liked it. But for this printed jersey I needed to face the "lapels", which introduced a structure absent from the original. I drafted a pattern piece for the facing. On auto-pilot, I actually interfaced these pieces (Facings.Must.Be.Interfaced...). What was I thinking? Way too stiff. It is, however, possible to pull fusible away and cut it out, which I did today. I like it better, but it's not my most favorite piece ever. Here it is with my orange cashmere skirt - already a favorite even though I've only worn it a couple of times.